With examples of Russian-created Facebook pages behind him, Sen. Patrick Leahy, D-Vt., questions witnesses during a 2017 Senate hearing on Russian-backed ads on social media in the 2016 election. Now, the Federal Election Commission is looking into increasing disclosure requirements for online ads. 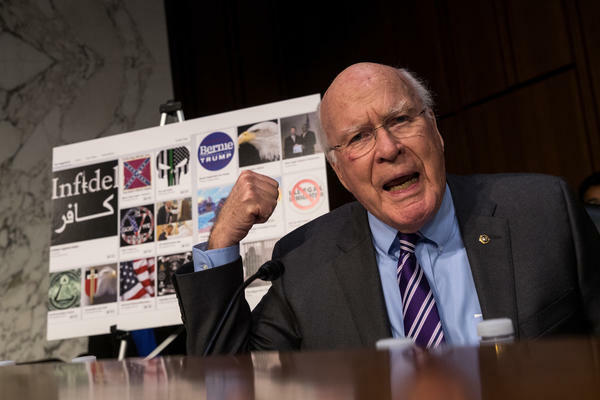 The proposal would update FEC regulations dating back to 2006, when cutting-edge digital politicking involved buying ads on websites and blogs, mobile apps were just surfacing and internet-connected appliances were beyond the horizon. Those earlier regulations generally used the existing rules for radio and TV advertising. Now, with the commission under pressure to deal with digital ads, chair Caroline Hunter, a Republican, and vice chair Ellen Weintraub, a Democrat, negotiated a compromise that blends provisions from both sides into a single proposed rule. The proposal will be shaped through public comments over 60 days, and a June 27 public hearing. The commission expects to get comments from social media companies that would have to comply with the new rule, and from other experts. "We're open to possibilities that aren't even in this document," Hunter said. Digital media consume increasing amounts of political advertising. In 2012, when President Barack Obama ran for re-election, digital political spending totaled $159 million, the FEC says. Four years later, when President Trump was running, the total was $1.4 billion. Although the FEC is acting after Russian trolls spread advertisements through social media during the 2016 presidential election, the proposed rule wouldn't have touched most of those ads. Disclaimers are required only for "express advocacy" messages that attack or support candidates. The Russian ads were not that direct, and many focused on issues without mentioning the candidates.